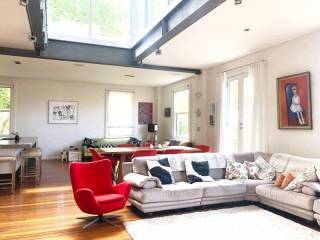 Newly renovated charming Federation home comprising four tasefull designed & decorated. 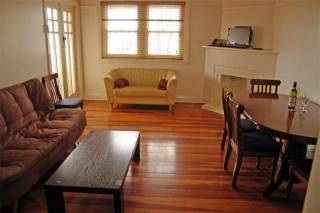 Air Conditioned self contained apartments in Lewisham Sydney Australia. 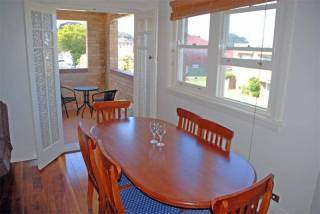 We offer comfortable accommodation located minutes away from lively portuguese village of Petersham - 'Little Portugal' with an abundance of popular eateries & all amenities. Buses at the front door to East Balmain Wharf 444, 445 & 428 Martin Place. 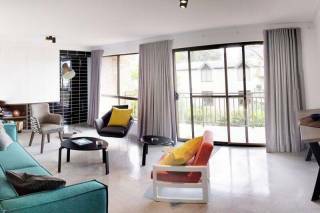 An impressive heritage turned blackwood staircase leads you to the top modern apartments. The whole house features high ceilings and hasperiod features. First floor modern fully tiled two bedroom apartment with king/twin & queen bedroom,with built-in wardrobe and persian rugs. Built in wardrobe in twin bedded room. Separate bathroom with shower, WC & vanity. Living/kitchen area has a double sofa-bed for 2 extra guests. Fully equipped kitchen with full stove, microwave, coffee makers,toaster, electric jug & all cooking utensils supplied. Unreserved Off-Street parking available one space per Unit. Internal laundry with autommatic washing machine and drying rack is supplied. Family accommodation with cots and high chairs available upon request at no extra cost. BBQ & picnic area, gardens and ball games area.